Download the all the specifications and datasheets you need to make your sign decisions fast, easy and professional. Interior specifications and datasheets for our architectural sign systems are provided for your convenience. Each specification is available in an editable Microsoft document format and as a standard web page (HTML). 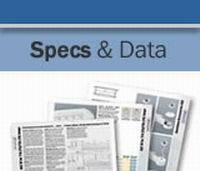 Exterior specifications and datasheets for our made available here for your convenience. Each specification is available in an editable Microsoft document format and as a standard web page (HTML).